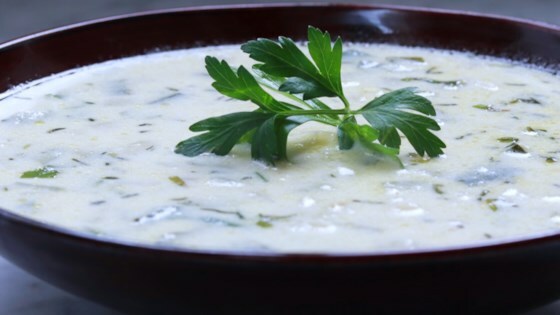 "A fragrant zucchini soup that makes a very satisfying light meal." Heat the butter in a large saucepan. Add the zucchini, potatoes and onion. Cover and cook for 2 minutes on high heat, shaking pan occasionally to prevent sticking on bottom. Add chicken broth. Lower heat to medium low. Simmer until potatoes are tender, about 15 to 20 minutes. Add the freshly chopped herbs and milk. Heat. Serve hot with a spoonful of sour cream on top of each serving. A hearty soup with Italian sausage and vegetables made in a slow cooker. This was very good, had to omit the savory but it was fantastic without it too! Also very easy and quick to make, Thank you for submitting this recipe. my german friend insisted on following this recipe to a tee. i was not sure how it would come out, ( it sounded bland), however, i thought it was delicious!!!! Really good with Italian bread and cheddar cheese sprinkled. I also added fresh chives, dill, marjoram and sliced mushrooms. Tried this soup and I found it tasty. I did not have but 2 zucchini but had everything else. I will make it again the way it is. I did add salt but that is personal taste.